The Double Lane Slip N Slide is double the fun with its dual lane of 30 feet of slick aquatic action. 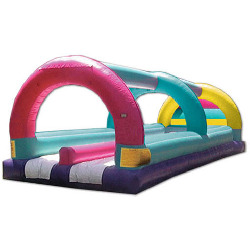 The inflated end wall will keep all your guests safe and keeps all the primo sliding contained. With a dual lane slide your guests will be able to enjoy more sliding action then they can handle. Take a challenge and go for a slide.